If you found an old picture and wish to take a shot of the after-picture, it is best to first make a printout of the before-picture or copy it to your smartphone. Once on site, you then take a sample shot and compare it with the old photo, and then correct your position if necessary. In order for the images to overlap well after subsequent alignment, it is important that the perspectives from which the two photos were taken are as close as possible to one another. The more the perspectives differ, the more distorted the images will be later. The transformation capacity using markers is not unlimited and depends on this first step. How does one determine from which position the image was taken? As illustrated by the figure on the left, the problem here is how far to the right or left (x) and how far back or forward (y) the photographer has to go. To find out, it is useful to find one or two points of reference in the picture that provide spatial information in both the x and y dimensions. These can be prominent points such as a roof or balcony corner or tower tops that overlap other prominent parts in the picture. A possible reference point in this picture are the two turrets in the upper right part: The finials almost overlap and are almost at the same height. Had the picture been taken further to the left, there would have been a gap between the two towers. Had the picture been taken further ahead, the cross of the right tower would have been higher than on the left, since the right tower is further ahead (and vice versa it would have been taken further back). If the two objects find themselves in exactly the same relative position in your after-picture, you have found the perfect position! In this picture, the lower right spot is particularly suitable as a reference point where the two houses overlap. As shown in the picture above, the outermost window of the front house is directly below the window of the rear house (indicated by the red dashed line). This shows the x-dimension, i. e. how far to the right or left you have to go. Furthermore, it can be seen that the upper edge of the window of the front house is directly below the uppermost floor of the rear house. This provides information about the y-dimension, i. e. how far forward or backward you have to go. Overlays as in the examples give clear spatial information, i. e. if the relative positions in this part of the picture are correct, the perspective is correct with respect to the whole picture. To be on the safe side, you can also look for another reference point. 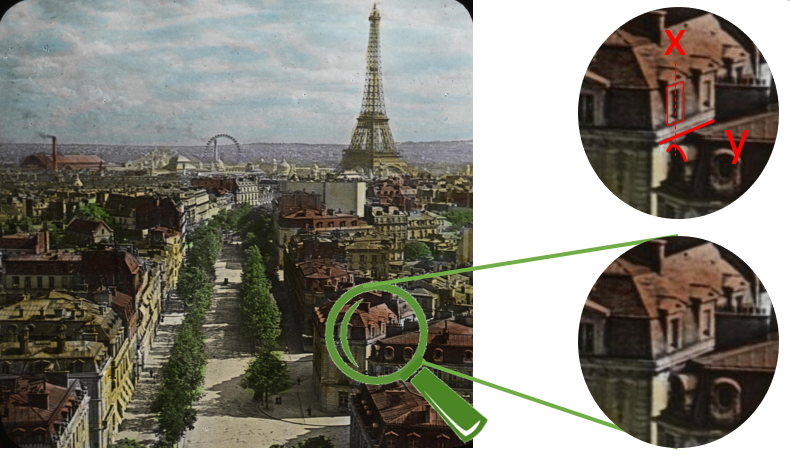 Example 3: Since none of the old buildings except for the Eiffel Tower are still in place, it is impossible to find overlaps here. However, the bank forms a line whose angle provides information about the position: The further you move to the right, the smaller the angle, the further to the left, the larger. It can also be useful to search for lines in the beforehand image and compare their angle to the horizon. This is obviously not an exhaustive guide for all motives. With time you may find your own strategy, which you can share in the forum! It is advisable to take several pictures, especially if you are not sure about the position, and then to select the one with the best matching perspective later on the PC. It is best to do this systematically: For example, after you have taken a picture, go one step to the left, take the next one, go another step to the left, and retake, and so on. In photography, the morning and evening hours are referred to as the "golden hour" of photography. The pictures get a nice colour contrast during this period. In this case, markers were distributed over a large area, both in the foreground and in the background. At least four markers must be placed. 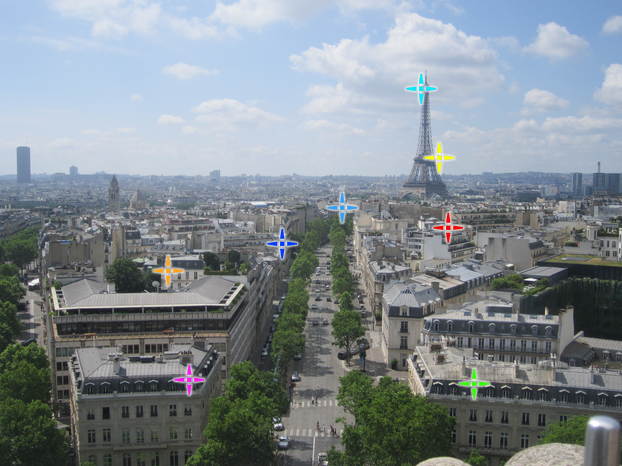 More markers can improve the alignment (how many additional markers are useful depends on the image). 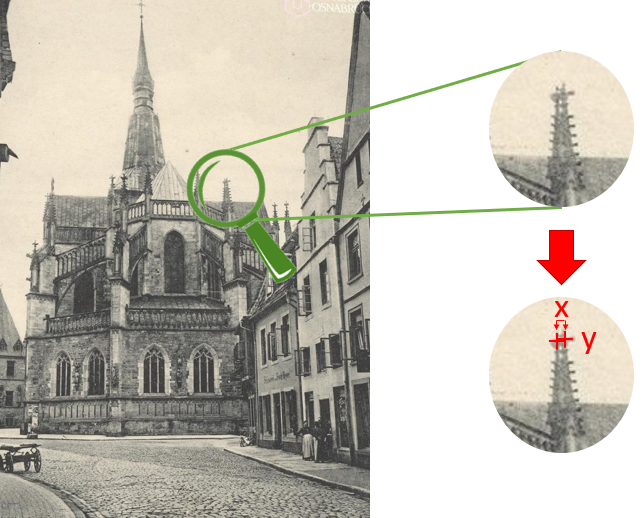 If in the result the pictures at the markers are not overlapped, although the markers have been placed at the matching places, there is a little trick which is sometimes helpful: You can drag the marker in the new picture in the direction where the old picture is still to be shifted (like a net you are dragging). The markers will then no longer be located at matching points, but the overlay will improve. The precondition, however, is that the perspectives are the same and one must not exaggerate, because otherwise the images will be excessively distorted. If you have any questions or need help in taking or aligning your pictures, please do not hesitate to ask the Forum! If you would like to rate other users’ pictures or upload your own pictures, you have to register. Which information will be required during the registration process ? Each user must pick a username, an email address and a password. Optionally, a display name, a location and a time zone may be chosen. What is the display name good for ? By default, the user name is listed as author of an image in the tabular view and in the single view. If the user has provided an optional display name, it will be used instead of the user name in the single view. Where do I get suitable before-photos ? Before-images can be found in our template gallery. Besides, image galleries of local museums and media databases of newspapers often carry historical pictures. Freely available pictures are offered by Flickr. What is important during the shooting of the after-photo ? Take a printout of the before-photo with you and try to find the original spot by comparing the printout with the live camera view. Which picture formats in portrait and landscape mode are suitable ? In general: portrait mode is less suitable, since during presentation it generates black stripes left and right of the photo. Pictures in landscape modes fit best on a typical 16:9 display, if they respect the same ratio. Therefore we have optimized the single view display for the presentation of a 16:9 photo next to the Google map. Other ratios like 4:3 are also possible, however they waste a little more space. What do I have to consider during the upload process ? Both the before- and the after-photo are uploaded and may/must be supplemented with a category (buildings, interior, nature, people), a title, a description, a location and the two recording dates. Important: the user must have the authorization to publish both pictures. What do I do, if I don't know the exact time of recording ? If you don't know the exact date of a photography, you may guess the year and set it to "Exact time unknown". Data for month, day, minute and second may be set to "unknown". If provided, information for location and time may be extracted from the digital image EXIF data. What about the copyrights of my own pictures ? If the user has recorded the picture himself, he can choose the type of license. The most restrictive would be "All rights reserved", which means, the photo may be inspected, but not distributed without explicit approval of the author. A more liberal approach would be "CC BY-ND". This Creative Commons license allows the distribution of the photo, in a commercial and non commercial setting, as long as the author is clearly stated and no modifications are made. What about the copyrights of foreign pictures ? If you use a picture provided by an archive, which comes already with a copyright license, it is your duty to keep that license attached to the image and propagate it further. How do I align both photos ? Our image transformation makes sure, that both photos fit together pixel by pixel. 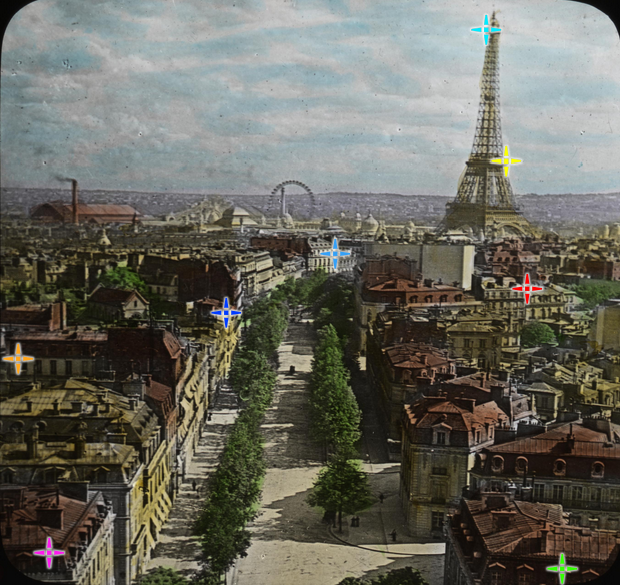 For this reason, please place with the mouse up to 4 colored markers on the before-photo and the after-photo at distinctive spots, that represent the same location in the scene, e.g. the corner of a building or the top of a tower. After aligning the two pictures with our software, you may decide whether you are happy with the result or whether you would like to start all over again with a new set of markers. Be sure, to place markers both in the foreground and in the background. How can I search the database ? All image pairs can be filtered by the categories, by the time interval boundaries and by the time interval duration. Terms within title and description can be searched as well as for user names. The resulting hits will be displayed in tabular form and will be georeferenced on a Google map. The table can be sorted column by column. You may zoom in and out of the map. How can I sort the search hits? By clicking on the head of a table column all entries are sorted with regard to that attribute. What type of interaction is possible in the single image view ? You may move a slider with the mouse. You may rate the image with up to 5 stars. You may comment on the image by typing a few sentences in a text field below the last comment. Each user may award up to 5 stars to each image pair, that is not authored by himself. The average of all the stars given to an image results in the average rating, provided, there are enough ratings. What is the forum all about ? The forum is a place for photographers to talk about their experiences and ideas in the context of before-after-photos: Where do I get historical pictures ? 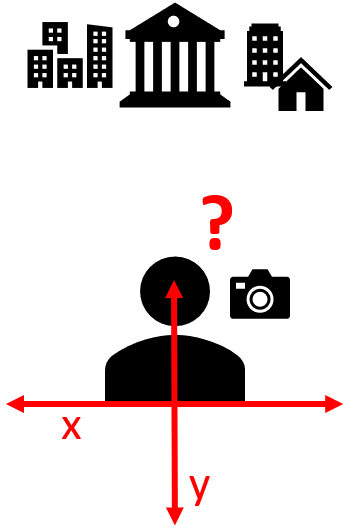 What is important during the shooting of a picture ? Which cameras are suitable ? What are fancy motives ?